3 Beds 2 / 0 / 0 Baths 1,853 Sq. ft. Description: Great location in peralta! Established neighborhood with lovely 3 bedroom, 2 full bath home on large .56 acre corner lot. This home has been updated with fresh paint, new flooring throughout and updated bath fixtures. Relax and enjoy cozy nights by the fireplace in the huge family room. Master suite has large walk-in closet and gorgeous bath with double sink vanity, solid surface counter tops and spa tub. Enjoy cooking in the gourmet kitchen with lots of cabinetry, granite counter tops, and breakfast bar. Natural gas and city sewer. Completely fenced and has large storage building. 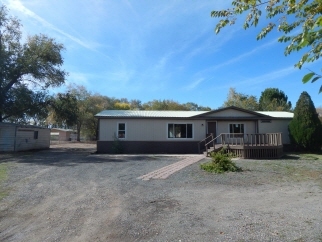 Easy access to i-25 and minutes to albuquerque. Close to all city conveniences.